Wondering how to get coverage in national newspapers and create a buzz around your business? We’ve been working with antique specialists Westland London for the last two years to help them gain more exposure and increase their sales. 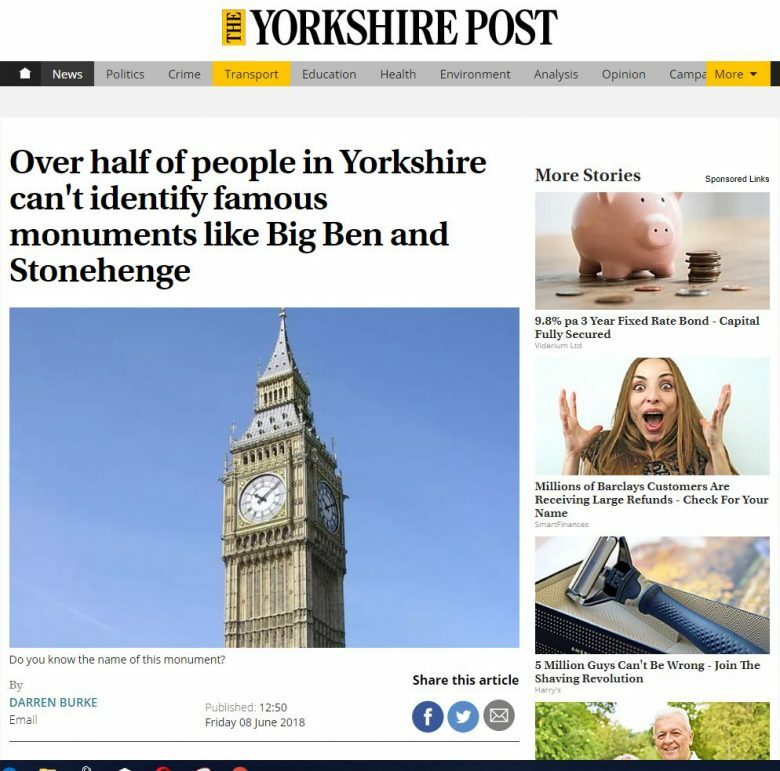 Recently, we ran a PR campaign which went down a storm, getting them coverage in both regional and national publications including the Mail, the Sun and the Express to name but a few. The first day of the campaign alone saw 13,000 extra visitors to their website – and the traffic keeps on coming. We’ve got a fair bit of experience when it comes to PR campaigns – (you can find out more here) – and in the end it all comes down to one thing: a strong, unique idea that will pique the media’s interest. We sat down as a team think to about relevant ideas that would be picked up by national and regional newspapers and niche publications. As always they are looking for something interesting, informative or fun – and not promotional. 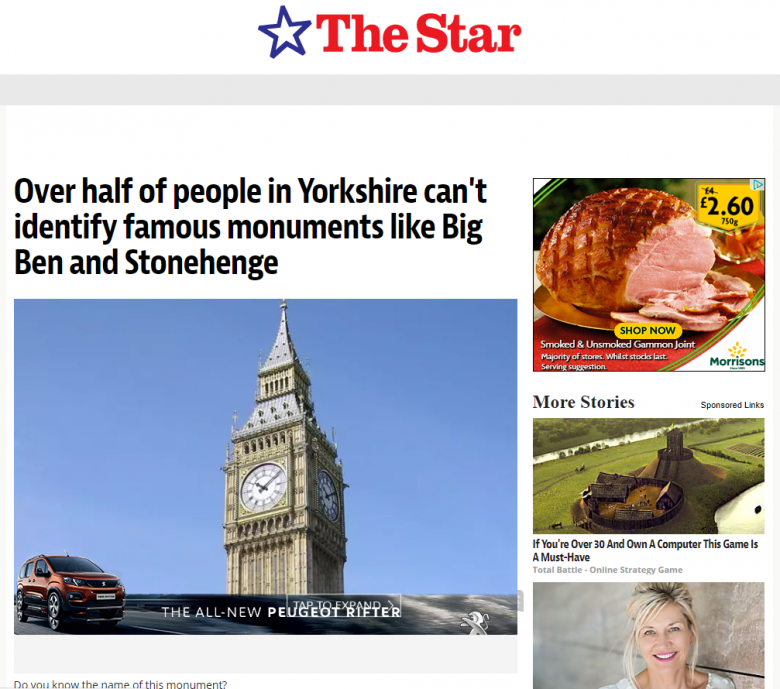 After honing in on the idea of whether people were good at recognising British landmarks, we spent plenty of time discussing how to make the campaign work and a format that would be most likely to grab a journalist’s attention. 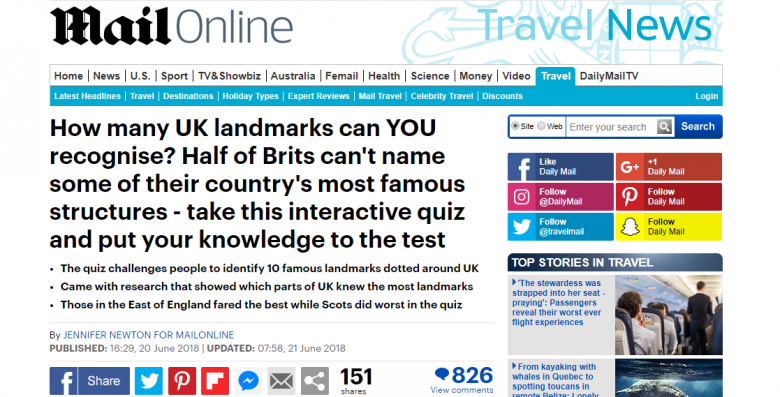 Firstly, we decided that by conducting a survey of 2,000 people we would have a strong data set revealing how clued up Brits are on their local landmarks. This would form the basis of our press release – more of which later. 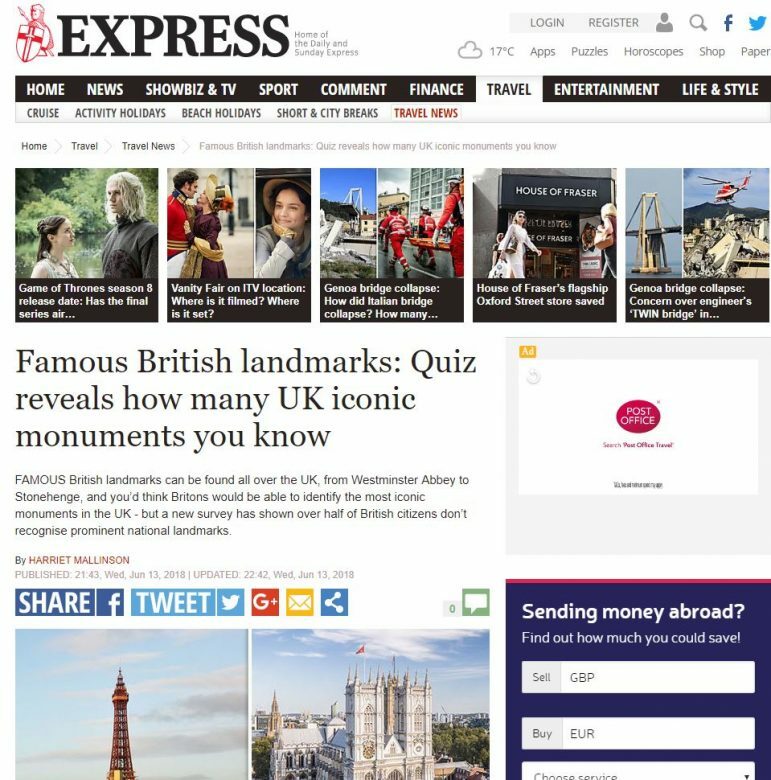 Our experience has shown that newspapers are keen on interactive elements – things that give the readers a chance to take part. 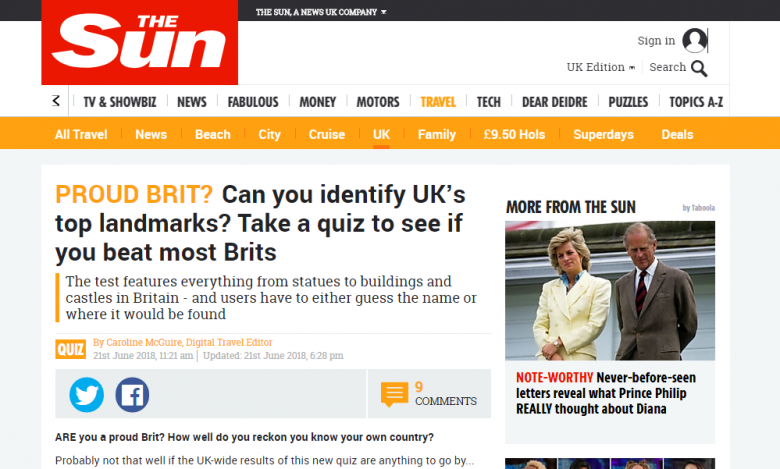 We knew that would increase our chances of getting the story picked up – so we created an interactive quiz allowing readers to put their own knowledge to the test. Agreeing on the plans was a good start, but then came the real work. Key for us was ensuring the quiz was easy to use and visually appealing, so we created a few options before settling on the final design. We then tested this thoroughly for glitches across different browsers and devices – even the smallest technical issues can really hamper the success of a campaign so it’s important to make sure everything is perfect before it gets the final sign off. If you’re thinking about how to get coverage in national newspapers, a snappy, attention-grabbing press release is always a good place to start. We collated all of our survey data – also broken down into regional figures to garner more interest – and put together a release highlighting the most interesting findings. It’s worth noting that writing a press release isn’t just a case of including all the information you’ve collected and sending it to everyone you can think of. 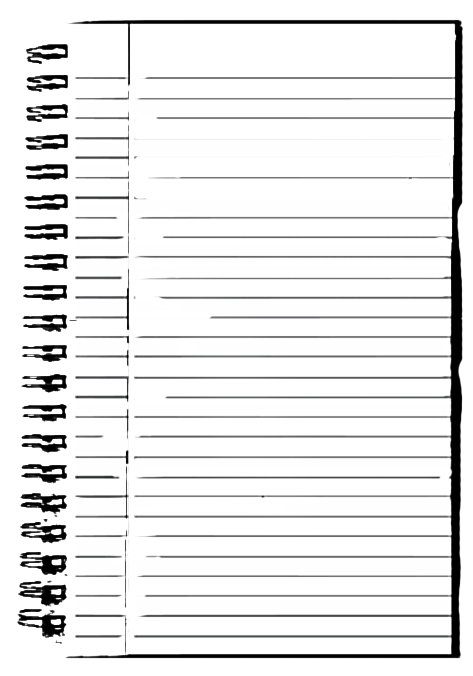 Remember that reporters receive hundreds of press release every day – so it’s much better to create a targeted, short piece to avoid it being immediately deleted. But it also helps to have contacts! Once we’d done all the hard work it was time to sit back and see what happened. But cuttings and coverage aren’t the only measure of success for a PR campaign. The first day of the campaign alone saw 13,000 extra visitors come through to Westland’s website, a massive boost for the business. That number is rising every day. Getting coverage in national newspapers or on TV or radio isn’t easy, but it can make a real difference to your business – both in the long and the short term. With a strong idea, interactive content and a snappy, targeted press release, you are giving yourself a real chance of creating a viral campaign that will be picked up by the press. If you’d like any advice or help on how to get coverage in national newspapers, feel free to drop us a line – we’d love to hear from you.